Chris Gunter says Wales' players want Chris Coleman to remain as manager. Coleman's current contract expires after Euro 2016 and the former defender says he and the Football Association of Wales are "apart" on terms over a fresh deal. Reading full-back Gunter says Coleman, 45, is the best manager he has ever worked under. "I would be gutted if he was not to stay," Gunter told BBC Wales Sport. "It would make no sense, because it's the first time we've qualified in however many attempts we've had. "If you were to ask any of the 23 players in the squad, I think every single one would say the exact same thing. "I would be amazed if the FAW were not doing every single thing possible to sort that contract out." Coleman succeeded the late Gary Speed in January 2012 and, in qualifying for Euro 2016, guided his country to their first major tournament since the 1958 World Cup. Gunter revealed the respect for the former Crystal Palace and Blackburn Rovers player in the Wales dressing room helps to inspire the side. "There is a feeling of wanting to do well for yourself, and for the country, but also because he's the manager," Gunter told BBC Wales Sport. "What he's done, if you actually step back and think about what he has done in his time as manager, it is ridiculous. "Yes, he's had a good squad to work with and a really talented group of players, but from where we've come in such a short space of time and the whole feeling around the national team, to what it is today, is unbelievable. "I have never played in a squad that has the respect for the manager as much as that. "I've played in squads where the whole squad has been behind the manager, but not to the extent this squad has for this manager. It is crazy really." Former national team boss Mark Hughes has said the Football Association of Wales have to "be careful" not to lose manager Chris Coleman after Euro 2016. 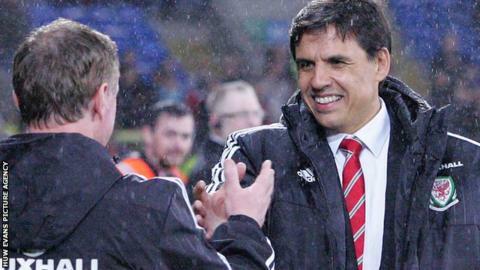 Gunter is worried momentum could be lost in the long term if Coleman was allowed to depart ahead of the 2018 World Cup qualifiers. "We want to go to the Euros and do really well, but then take it on, because we've got a World Cup to qualify for," Gunter said. "We don't want to be in a situation where we are looking back in two years and saying 'remember when we were preparing for the Euros and how good it was?' and we are back to where we were."